Yay I am finally back with Tuesday Stamping!! I hope you guys missed these posts as much as I did. I decided on 4 random polishes again today. Most of these I used recently. Have I mentioned how much I love this polish? Why yes I did. I just want to mention that if you read my post yesterday where I swatched this polish I mentioned that the blue shimmer didn’t pick up very well on the swatch. Here you can see that blue beautifully on the black. Ok back to stamping. Even though this polish stamps pretty will with clear lines and it shows up on the black and the white, I definitely prefer it on the black. It’s a little different and the shimmer really stands out. It doesn’t look bad on the white but I do have better purple polishes to stamp with. This is such a beautiful light lilac polish that I was really surprised by how well it shows up on the black. It does show up on the white as well but it is a light colour so it gets a bit washed out. Images stamped crisp and clear though so I think this is a great winner for subtle stamping. There is just nothing I don’t love about this polish. It shows up great on the white and not too badly on the black. 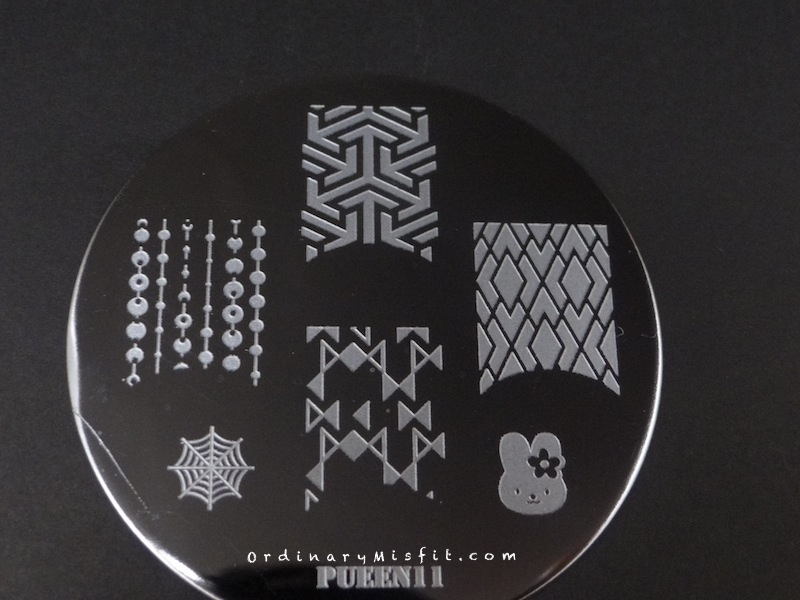 It stamps pretty well too and the holo bits just make this absolutely gorgeous. Unintentionally, this one is the odd one out today. The others were all shades of purple and this one is more peachy orange. Either way, it still stamps really well. I was surprised again by how well it shows up on the black. Crisp images and looks great on the white and black. I’m a little torn about a favourite today. Where did Suzi’s man-go? seems like a logical winner but I love how ultra violet looks on the black too. What do you think? Do you want to see any of them stamped over a specific colour? Do you have an idea for a stamped design you would like me to do? Do you have any suggestions for changes or additions you would prefer on these posts? I would love to hear from you. Or if you want to choose the next 4 polishes let me know. I have another question. I recently got some Mundo de Unas stamping polishes and of course we all know they stamp very well. Would you like me to do a few Tuesday Stamping posts with the ones I got? Or do I stick to the regular polishes as I have done? If you would like to see the MdU’s stamped I am more than happy to do them. Let me know? About MdU, I personally am not that interested in stamping tests as I know they stamp great. Awww Joyce!! Thank you so much! You are always so encouraging about these posts and I love that they can help you in any way! DS Extravagance is SOOOO gorgeous!!! Man-go is the surprise winner for me! ?